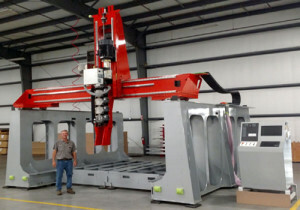 YORK, PA, U.S.A., July 30, 2015: American Kuhne customer Thermwood Corporation, a leading US-based manufacturer of CNC routers, has announced a program to develop a 3D Additive Manufacturing System capable of making large carbon graphite reinforced composite thermoplastic components. The systems utilize a ‘near net shape’ approach where a custom-built vertical, integrated extruder deposits or ‘prints’ carbon graphite filled thermoplastic material to quickly create a structure that is close to the final shape. Once it cools and hardens, it is then five-axis machined to the final net shape. This innovative process minimizes three challenges of conventional 3D printing, particularly for large parts: uneven cooling, material waste, and extensive post-print processing. 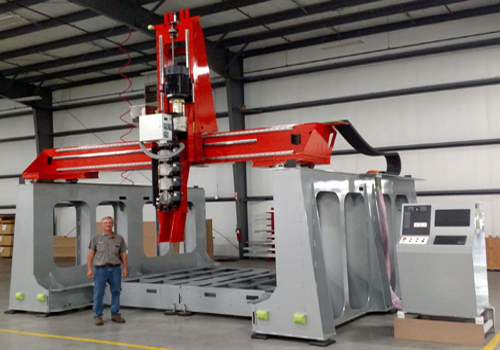 These new systems will be based on Thermwood’s Model 77, semi-enclosed, high wall gantry machine structures, which are currently offered in sizes up to sixty feet long. With the addition of an optional second gantry, both the ‘additive’ and ‘subtractive’ processes can be performed on the same machine. The initial development machine, nearing completion, can make parts up to ten foot by ten foot by five foot high. It is equipped with an integrated, vertical 20HP, 1.75” inch diameter, 24-1 L/D extruder and support equipment capable of processing over 100 pounds of material per hour. Despite the relatively heavy weight of the extrusion system and head, which are both mounted on and move with the machine, the machine generates impressive performance with high acceleration rates and high feed rate capability.